University of Cambridge International Examinations is the world’s largest provider of education programmes and qualifications for 5–19 years old. Over 9000 schools in 161 countries around the world offer the Cambridge qualifications. It is a part of Cambridge Assessment, a not-for-profit department of the 800 years old University of Cambridge. Cambridge programmes and qualifications for 5–19 years old are divided up into four stages: Cambridge Primary, Cambridge Secondary 1, Cambridge Secondary 2 (IGCSE) and Cambridge Advanced (A level). The International General Certificate of Secondary Education (IGCSE) administered by University of Cambridge International Examinations (CIE) is the world’s most popular international qualification for 14–16 years old. The IGCSE Programme is firmly established and recognized world-wide and is taken in 144 countries and in more than 2600 schools around the world. Currently, in India we have around 300 schools offering IGCSE course. It is well recognized in India as equivalent to Grade X and used as a preparatory level for A Level, International Baccalaureate Diploma (IBDP) or State HSC. It is also equivalent to the Grade 10 examination of the CBSE and ICSE or the middle year Programme of the IB. The IGCSE programme is more practical and application-based. It has a broader spectrum of subjects that lead to all-round development. IGCSE examinations test students’ knowledge, not their memory and speed. The focus of the IG pedagogy is on ‘how to learn’ rather than ‘what to learn’. The purpose of IGCSE is to produce global citizens. The IGCSE curriculum is more challenging, but the challenge is in the quality of assignments, not in the quantity of the assignments. The IGCSE has always emphasized adding value within a national context whilst also contributing to international level. The development focus is to safeguard distinctive cultural identity through specific language and literature syllabi, for example; or to include study of regional geography or history, whilst also encouraging an international outlook. Thus, the importance of an appropriate mix of global and local contexts is well recognized as an essential dimension of IGCSE. How many schools in India offer IGCSE programme? (Grade A* is awarded for exceptional levels of achievement). Will the selection of Core or Extended paper be mentioned on the final marksheet / result / report card? No. There will be no mention of Core or Extended selection on the marksheet. Who will decide the Core or Extended paper for a student? The school in consultation with the parents will decide whether a student will opt for Core or Extended paper. What is the curriculum for IGCSE at TIPS? Science Stream: English; Mathematics; French / Hindi; Physics; Chemistry; Biology; Economics; Information Technology. Commerce Stream: English; Mathematics; French/Hindi; Combined Sciences; Economics; Information Technology / PE. Why has TIPS selected specific subjects only for IGCSE? TIPS has selected the most popular subjects for IGCSE that meet the eligibility for higher studies in India. Does TIPS offer other subjects for IGCSE? TIPS allows its students to appear for other subjects in their individual capacity. However, coaching for additional subjects will be provided only if there are minimum 7 students opting for the same. What exams of CIE are conducted by TIPS? We conduct Checkpoint exams at the end of Grade 8, IGCSE exams at the end of Grade X. When are the IGCSE Board examinations normally conducted? Examinations are held in May /June and October /November each year with results issued in August and February respectively. 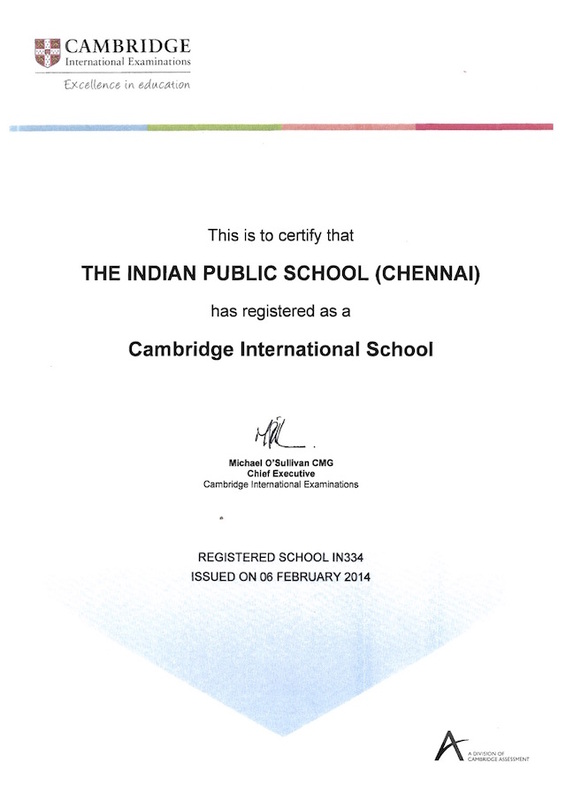 Students can appear for Cambridge IGCSE through the registered schools (CIE canters). From the year 2015, in India the Examinations are held in the month of March with results is May. When are the IGCSE Board examinations conducted at TIPS? At TIPS, IGCSE board examinations are held in Oct-Nov and the results are announced online on the 23rd or 24th of January every year, with the print copies of results available in the School by the 2nd week of February. These early results do synchronize with the admissions schedules of the Indian +2 boards (ISC/CBSE/HSC). However, school may consider permitting students to appear for June exam at their own discretion and managements approval. What will the students of TIPS do from November to June after IGCSE examination gets over in the month of November? Students at TIPS start DP program from January onwards so, they continue their study at TIPS itself. For those who wish to join other boards, we, at TIPS, have devised a special finishing school programme for our children from Jan to June. This 3 months programme includes subject specific classes to ensure compatibility with other boards and real life exposure. Thus, every child passing out of TIPS will have a well rounded and well groomed personality to face the challenges of life ahead. 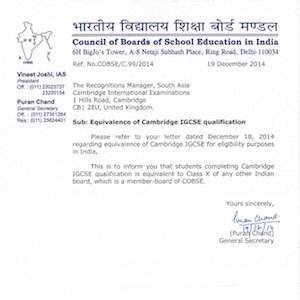 Is the IGCSE Programme recognized by Higher Secondary Boards and Universities in India? What options are available after completing the IGCSE Programme? We appreciate that our IGCSE students will continue at TIPS and follow the DP Programme in classes XI and XII. They can also opt for A level programme in any other International school that offers the same. 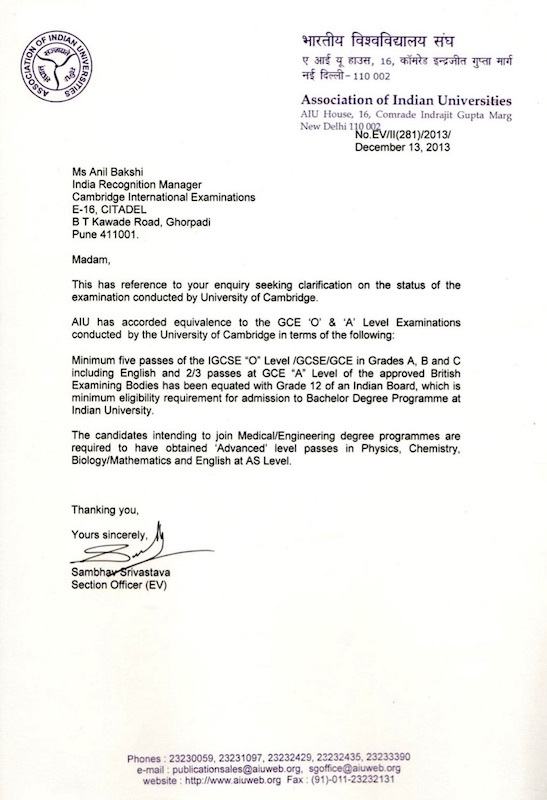 IGCSE also qualifies the students for admissions in all the Indian +2 boards (ISC/CBSE/HSC). IGCSE students are eligible for admission to local and national boards through both online and offline. It is pertinent to note that students who completed IGCSE can pursue IB Diploma programme as the most suitable option. The skill set inculcated in IGCSE are well suited to any International program, IB or A-Levels. I have heard that results are excessively strict for IGCSE Board students in X class compared to SSC Board student. 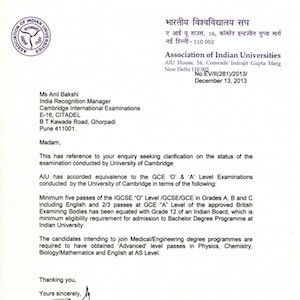 Hence IGCSE Board students are not getting admission in good colleges. IGCSE helps the students to develop key learning, problem-solving and investigative skills by encouraging an active, critical and questioning approach to study. With a choice of Core and Extended papers in most subjects, the IGCSE is suitable for students with different levels of ability. Hence it is wrong to say that results of IGCSE are stricter than SSC. However, we agree that the SSC students are granted marks very leniently including internal and sports marks. But all reputed colleges have accepted IGCSE and students are admitted for HSC. Even IGCSE students are allowed to fill online application form for HSC admission. I have heard that students get grades in the IGCSE mark sheet. Hence how will they get admission in colleges based on grades because in India we have Marks/Percentage system? Is the best of five policy in other states for HSC admission applicable to IGCSE students? No, the best of five policy is not applicable to IGCSE students, as of now. However, a pass in five subjects including English will make the student eligible for HSC admission. However, Association of Indian Universities give equivalency certificate only to candidates having A, B or C in the five major subjects including English. Can IGCSE student apply offline for HSC admission? Yes, IGCSE student can fill the form online through the website as well as directly to the college offline for HSC admission. My child was in SSC Board, now he /she has switched over to IGCSE curriculum. Will the transition be smooth? Certainly. There will be no hitches. We will take care of the ‘transition’ related issues. If the child is encouraged to have a proper attitude & aptitude he/she can easily switch over from any local Board to IGCSE Board. We also have special tutorial sessions before the commencement of the course for such students. Where I can find the list of schools in India that offer IGCSE and A levels? Kindly browse www.cie.org.uk/countries/india for list of schools providing IGCSE and A level curriculum in India. What curriculum is followed in the Pre-primary and Primary level at TIPS? TIPS follows Primary Years Program from International Baccalaureate based on the ideas, theories and practices prevalent internationally to develop the multiple intelligence of students such as cognitive and motor skills. Through each unit of inquiry, the students’ curiosity and imagination is sparked by exposing them to a new world of “Discovery with Action”. What curriculum is followed in the Middle School at TIPS? The Middle School /Checkpoint curriculum at TIPS provides natural progression from Primary Years and develops children’s knowledge and skills in Mathematics, English and Science. We offer the core subjects – English, Math and Science as per the curriculum framework given by the CIE. Checkpoint text books recommended by CIE are used for the purpose. Students’ language skills are further enriched through training in national and foreign languages like Hindi and French. The Social Studies are also taught, the emphasis is on developing students’ understanding of their environment and deepening their reverence for rich geographical wealth and the glorious historical heritage of our country. Students are further equipped with technical skills through the study of Information and Communication Technology. Cambridge Checkpoint exam is taken at the end of Grade VIII. Since when are students trained for Cambridge/ DP pattern of examinations at TIPS? At our School, students are trained for IB/ Cambridge pattern of examinations right from Grade 1 onwards. All inquiries, question papers are designed as per international curriculum so that students get used to solving application based questions. Schools recognized by the International Baccalaureate Organization and offering the IB curriculum are known as IB World Schools. There are just 40 IB World Schools in all over India. The list of authorized schools is available on the IBO website www.ibo.org. What is the International Baccalaureate Diploma Program-IBDP? 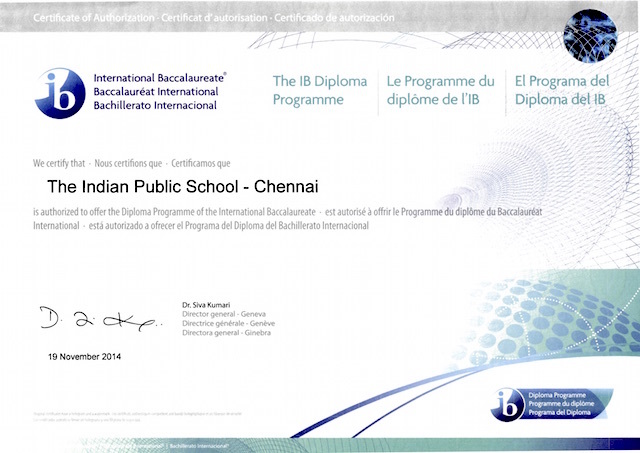 The IBDP is a comprehensive two-year course and is a rigorous academic program. It is designed as a pre-university program for students aged 16 to 19. There are a wide range of courses designed to meet the interests and requirements of different students. In addition to the courses offered, it is unique because only the IBDP includes the Creativity, Action and Service (CAS) program, the Extended Essay and the Theory of Knowledge course. Together these offer IBDP students experiences and skills they will not find in any other program. In addition, all DP students must study a two-year course called Theory of Knowledge (TOK); work to produce on Extended Essay (EE); and engage in Creativity, Action, and Service (CAS). What is the difference between higher level and standard level IB subjects? There is more breadth and depth in higher level subjects. The content in HL subjects requires 240 teaching hours versus 150 hours for standard level. Generally higher level subjects are more rigorous than Standard level. Which IB subjects should a student register for? Theory of Knowledge is an essay of 1,200-1,600 words written on a given title (from a choice of ten), followed by a ten-minute presentation of the essay by the student in class. Comprehensible written piece of 3,500-4,000 words in any chosen subject and title. Under Creative, Action and Service (CAS), each DP student must complete at least 150 hours of work spread over one-and-a-half years, engaging in some form of creativity, participating in sport or other physical action, and doing social service. Although the PYP, MYP and DP form a continuous sequence, each can be offered independently too. A student can join the IB Diploma Program after completing the grade 10 level qualifications from CBSE, ICSE or any other State Board .The Diploma program is equivalent to 10+2 level qualification through CBSE. Can the full IB diploma be studied online? No. It is not possible to complete the entire Diploma Programme online. One choose one or two subjects online though. What are the fees for offering diploma courses online? A: The usual IB exam registration fees apply, the course fees are set by the course provider. Refer to www.pamojaeducation.com for more information. What are the qualifications of the online teachers? Online teachers must hold qualifications and demonstrate successful experience as IB face-to-face teachers. This includes attending current IB professional development as well as successful training pertinent to online teaching and learning. How does a school know that an online student is actually attending the class? Do the school, parents and student get regular progress reports? The course provider, Pamoja Education, is required to report current grade averages for all online students on a regular basis. A site-based coordinator/link mentor will be the main point of contact with the course provider and receive information from the course provider on how to administer the courses, including registering students, retrieving grade reports, communicating with the online instructor, etc. The site-base coordinate/link mentor will communicate progress reports to the school and parents. Is there a limit to the number of online courses a DP student can take? There is no rule on a maximum number of online DP courses per student, but careful consideration to the nature of the student and the experience of the school with online courses should be factors in the decision. Currently most students are opting for one or maybe two online DP courses within their Diploma, but in very exceptional cases students have taken three. How is IB different from any other board of education? Can my child cope up with IB? The IB program is practical and application-based. It has a broader spectrum of subjects that lead to all-round development. IB examinations test students’ knowledge, not their memory and speed. There are no externally evaluated examinations till the Middle Years Program (Class 10). The focus of the IB pedagogy is on ‘how to learn’ rather than ‘what to learn’. The purpose of the IB is to produce global citizens, but it can be well-integrated with the local curriculum. Hindi can be offered as a second language in the IB Diploma Program. The IB curriculum is more challenging than educational boards like the CBSE and ICSE. The challenge is in the quality of assignments, not in the amount of work assigned. The rigor and high standards of the IBDP ensure that colleges and universities around the world recognize the IB Diploma as a superior academic program and a strong university – entry credential. Universities in over 110 countries recognize the IB Diploma and it will allow entrance to the most competitive universities around the world. The university admission authorities recognize the academic rigor of the IBDP, and value the “extra” parts of the Diploma, such as TOK, CAS and the Extended Essay. Most universities in Europe require the full Diploma as a qualification for entry. Higher Level Courses are broadly equal to British A-Level courses. 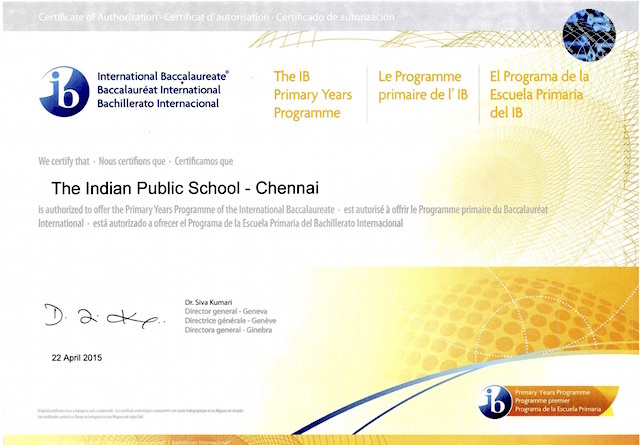 The IB Diploma has earned universal reputation for rigorous assessment, giving students access to the top colleges and universities in India and the world. IB is fast becoming the program of choice for Indian students preparing to pursue higher education abroad. Most universities even offer scholarships to IB diploma holders. Universities can be confident that this is a rigorous and transparent process. At the end of the two-year program, students are assessed both internally and externally in ways that measure individual performance against stated objectives for each subject. How are IB students assessed in the IBDP Program? There are two kinds of IB assessments: External and Internal. Some assessment methods include portfolios/dossiers, written essays, studio-work, experimental work, oral commentaries, as well as written exams and are tailored for different learning styles. Considering that exams may or may not reflect what a student really knows and what he or she is able to do, having a variety of assessment tools allows the IB organization to fairly assess the student’s true ability. In addition, the grading system for all the IB programs is criterion-referenced, to allow each student’s performance to be measured against well-defined levels of achievement. Assessments with oral and written components are assessed by examiners worldwide and monitored by chief examiners with ample experience. The IB exams are taken in November of the second year (Senior Year). Is IB too hard for most students? The IB is designed as a model of holistic education for the mid-range student and above. Statistically speaking, most students who earned the IB Diploma worldwide were of average or above average ability. It is not a program designed only for geniuses. What the IB program requires students to have are a strong work ethic, good time-management and solid study skills. The IB program offers courses at different levels (Higher Level and Standard Level). In addition, language courses range from introductory level to native-speaker level. The goal of the College/Career Guidance Program is to provide assistance to each student as they prepare for post-secondary studies around the world. The program aims to provide students with all the available and relevant data on which to base a decision to apply and/or attend a specific college or university. The career guidance counsellor will also prepare transcripts, school profiles and teacher recommendations, which will promote the student’s candidacy by highlighting known skills, achievements and potential. The criterion varies from one university to another and from one country to another. Generally, Universities give credit to higher level subjects with grades (5-7) and up to one year college credit for a good IB diploma score. Due to the fact that the requirements of individual universities or countries are constantly changing, the School cannot guarantee recognition of the IB Diploma or IB certificate. It is sole responsibility of students and their parents to verify the university/country requirements prior to initiating the IB Program. The IBO website provides a searchable database of countries and their recognition policies. It is strongly recommended that parents contact the universities directly to verify that the information is up to date. Visit the International Baccalaureate Organization’s website (http://www.ibo.org) for more details. Is the IB program stressful? The IB program is a rigorous two-year program. It is not a stress-free program. The level of stress can vary from one student to another and can be reduced, depending on the student’s acquisition of healthy study and organizational skills. A student who procrastinates and does not know how to manage time effectively will find it difficult to reduce the stress. All students are encouraged to complete assignments on time and meet the internal assessment deadlines. The teachers at AIS also work hard to coordinate major test and assignment deadlines, to keep student-stress to a minimum. What is the profile of a successful International Baccalaureate student? How are the teachers trained to teach CIE / IB qualifications at TIPS? The IB/ CIE curriculum at TIPS is enriched by IB/ CIE certified facilitators/teachers offering personalised guidance and mentoring to our students. The facilitators at TIPS undergo C.I.D.T.T. (Cambridge International Diploma for our Teachers and Trainers), face-to-face and online training for IB and CIE. National and International seminars and conferences enable them to upgrade themselves in mark schemes, and examiner’s report etc. The in house training department of TIPS conducts regular workshops, internal seminars and exchange programmes for the integration of teaching techniques within the TIPS family. Does DP curriculum prepare the students for state CET/ PMT / IIT-JEE and other Indian professional entrance exams? Of course, DP curriculum is more practical and application based. It enhances student’s knowledge, reasoning power and problem solving abilities which is required to clear all professional entrance exams. 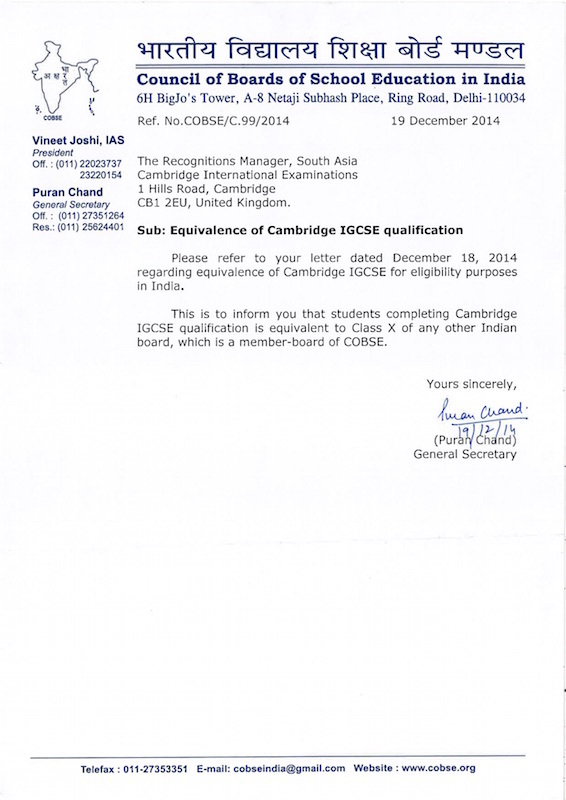 Cambridge Advanced stage which is in alignment with the Indian 11th and 12th grade curriculum. What are the subjects offered for A level at TIPS? Commerce Stream : English; Math; Accounts; Business studies; Economics. Science Stream : English; Physics; Chemistry; Math/Biology. Cambridge International AS and A Level syllabuses have been created specifically for an international audience. The content of International AS and A Levels is carefully devised to suit the wide variety of Cambridge schools worldwide and avoid any cultural bias. They are taken in over 125 countries and offer a choice of 60 different subjects. Cambridge International AS and A Level qualifications are widely recognised and valued by universities and employers alike. Some US universities give up to a year’s credit as a result. Every year, thousands of Cambridge International A Level students gain places at good universities worldwide – including the UK, USA, Canada, New Zealand and Australia. Three fair passes at ‘A’ level allows a student to skip a year in US, UK and Canadian Universities. Cambridge Checkpoint, a new and innovative diagnostic testing service, is a major landmark in the development of assessment services from UCIE. The tests cover all major areas of learning required in the first years of an international secondary education. Cambridge Checkpoint tests are available in English, Mathematics and Science. Checkpoint is not a formal qualification with a certificate, although a Statement of Achievement is produced. There is no failing or passing in this test. It is a way in which CIE can help students make the most of their educational opportunities. How will the Checkpoint results benefit us? What are Checkpoint Tests like? There are two papers in each subject, each approximately one hour in length. They provide good preparation for Cambridge IGCSE, by allowing students to experience an external exam. All the questions have been tested by Cambridge to ensure they are suitable for 14 years old and provide useful information and feedback. How is the Checkpoint Report? Each student will receive a Statement of Achievement and a report that provides more detail about his or her performance. Results are given as Checkpoint scores between 0.0 – the weakest performance and 6.0 – the best performance. The average score is between 3.0 and 4.0. The report gives a score for the subject as a whole and for the main topics, so that teachers can identify any important strengths or weaknesses. The report gives information about the questions that provided evidence of the student’s strengths and weaknesses. Can Checkpoint scores be used to predict Cambridge IGCSE results? Research has shown that Checkpoint scores are good indicators of performance in IGCSE. Students with the same Checkpoint score will achieve a range of IGCSE grades, because some will work harder and learn more than others. See the middle of the range in the table below. Naturally, with appropriate efforts students can better their predicted grade. They will achieve less if they do not put in the effort. When are the Checkpoint exams held at TIPS? Cambridge Checkpoint exams are held at the end of Grade VIII in Oct. Results are expected to receive within four to five weeks.